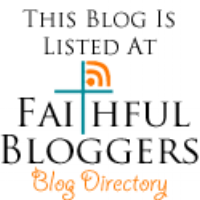 Thank you for your interest in joining the Faithful Bloggers Christian Blog Directory! We would love to have you as part of our blogging community and enable you to have access to this feature. Please take a few minutes to read the notes below and then fill out the form at the bottom of the page. If your blog is private, or visitors have to be invited to read - please do not submit to the directory. All blogs in our directory must be wide open to the world for all to enjoy. We reserve the right to refuse to list any blog or site for whatever reason we want. We will not accept blogs that are not family friendly, contain foul language, nothing but advertisements, or spammers. Your blog needs to be at least one month old and have at least 5 posts published to be considered for approval. 2. Enter your name and email address below. After you hit subscribe, you will receive an email which must be confirmed. #3. Complete the Submission Form. After you complete #2 you will be automatically directed to the form which you must complete in order to be placed in the directory. That's it! Once your listing is approved your site will be listed on the Faithful Bloggers Blog Directory. PLEASE NOTE: It can take up to a week to be approved and you will not be notified unless your blog is not approved.